Any motorcycle rider who shares the road with cars and trucks knows the importance of defensive driving. But some motorcycle accidents cannot be avoided, regardless of the care and skill demonstrated by a motorcyclist. 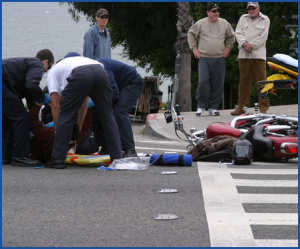 Motorcycle accident statistics show that motorcycle accidents typically account for a disproportionately high number of catastrophic traffic accidents resulting in brain injury, broken bones, paralysis, and wrongful death. Tragically, the vast majority of motorcycle accidents were unavoidable by the motorcycle rider who was injured or killed but could have been easily avoided by the other vehicle driver who caused it. HSSH has experienced motorcycle accident lawyers and would be happy to discuss your claim with you. The consultation is free and if we do not make a recovery on your behalf, you owe us nothing. Just call 800-753-5359 or 806-376-8903 (Texas office) or 303-333-2200 (Colorado office) or contact us by clicking here. Also, contact us by telephone or click here for a free copy of: “FIVE BIG MISTAKES PEOPLE MAKE AFTER ACCIDENTS” Find out the do’s and don’ts if you are involved in a vehicle accident. Learn what the insurance companies don’t want you to know.